In this gallery some of Rose’s earliest works from Beckenham Art School and the Royal College of Art are included alongside early portraits of Roger Hilton, fellow student Alan Green, the artist Bob Bourne and poet W.S. Graham. Even in these early paintings, the importance of drawing is acknowledged and is very visible within the paintings. The years between 1965-75 were devoted to looking after Roger and bringing up their sons in the remote mining district of Botallack Moor, St Just, where, after a lengthy illness, Roger Hilton died in 1975. During this period Rose was preoccupied with family life, painting infrequently purely for pleasure. Drawing and painting from the figure was an important activity in Botallack and, in the intervals between looking after her family, Rose also made a closer engagement with other artists’ work, regularly looking at the Old Masters to enrich her art. 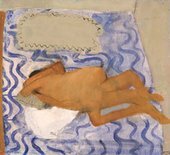 Her interest in colour led her towards the French painters of the modern period, especially the rich chromatics of Pierre Bonnard (1867–1947), Amedeo Modigliani (1884–1920), and Henri Matisse (1869–1954).